LEXINGTON, Ky. (Aug. 19, 2014) – A new web-based program developed by University of Kentucky Markey Cancer Center researchers will provide a simple, free way for healthcare providers to determine which brain tumor cases require testing for a genetic mutation. Gliomas – a type of tumor that begins in the brain or spine – are the most common and deadly form of brain cancer in adults, making up about 80 percent of malignant brain cancer cases. In some of these cases, patients have a mutation in a specific gene, known as an IDH1 mutation – and patients who have this tend to survive years longer than those who do not carry the mutation. 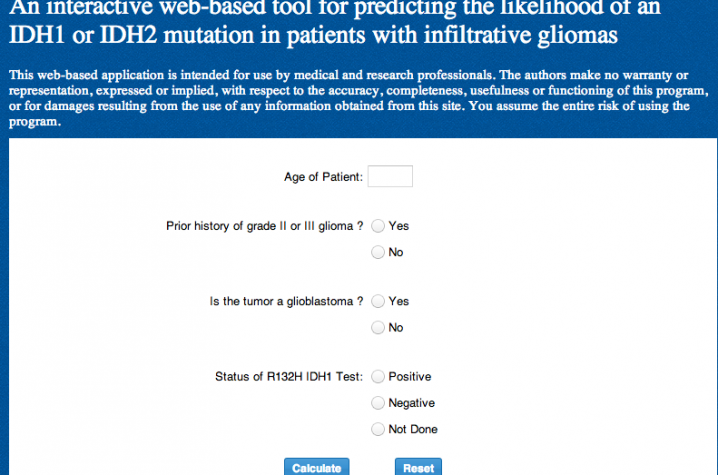 Developed by UK researchers Li Chen, Eric Durbin, and Craig Horbinski in collaboration with software architect Isaac Hands of the UK Markey Cancer Center Cancer Research Informatics Shared Research Facility, the program uses a statistical model to accurately predict the likelihood that a patient carries the IDH1 mutation and requires screening. Gliomas are often tested for IDH1 mutation following surgery to remove the tumor, but undergoing this type of testing often requires stringent insurance pre-approvals due to rising healthcare costs, Horbinski says. "Currently, there are no universally accepted guidelines for when gliomas should be tested for this mutation," Horbinski said. "Obtaining insurance pre-approval for additional molecular testing is becoming more commonplace, and this program will assist healthcare providers with an evidence-based rationale for when IDH1 screening is necessary." Additionally, Horbinski notes that the program will help conserve research dollars by helping brain cancer researchers narrow down which specific older gliomas in tumor banks – previously removed in a time before IDH1 testing was routine – should be tested as data for research projects. Horbinski's research on the program was published in the May issue of Neuro-Oncology. The work was funded through a grant from the National Cancer Institute, the Peter and Carmen Lucia Buck Training Program in Translational Clinical Oncology, and the University of Kentucky College of Medicine Physician Scientist Program.